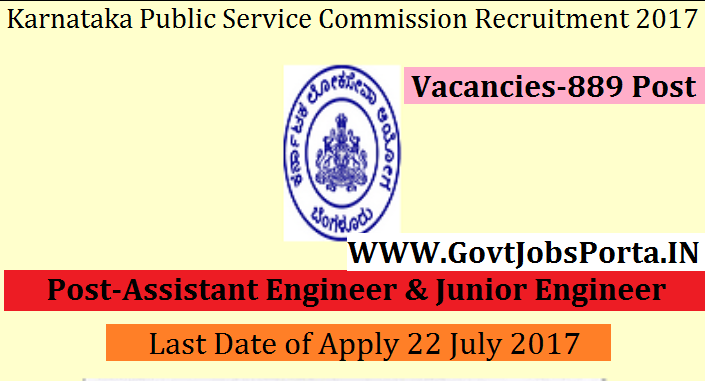 Karnataka Public Service Commission is going to recruit fresher candidates in India for Assistant Engineer & Junior Engineer Posts. So, those candidates who are willing to work with this organization they May apply for this post. Last Date of Apply 22-July-2017. Total numbers of vacancies are 889 Posts. Only those candidates are eligible who have passed Degree in Civil or Mechanical Engineering as per the requirement as the case may be or must be holder of a Diploma certificate from a recognized Institute of Engineers regarding pass in Parts – A and B of the AMIE. Indian citizen having age in between 18 to 35 years can apply for this Karnataka Public Service Commission Recruitment 2017. What is the Process for Selection this KPSC job? 2: Selection will be held on Computer based recruitment test.